Ricky Lloyd didn’t mince words after his stellar pro debut. “I love the CFL man, I just love it,” said the Lions’ rookie quarterback. And why wouldn’t he? 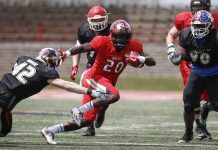 The Minnesota State product finished with 121 yards passing and had three touchdown strikes in a 4:41 stretch in the third quarter to help lift his squad past Calgary 36-23 in their pre-season opener on Friday night. Not bad considering he had to come in a bit sooner than expected after Cody Fajardo left with an ankle injury late in the first half. He went the distance and perhaps made the quarterback discussion a little more interesting. “I felt nervous at first, but after that first hit I felt good,” explained Lloyd. The third quarter floodgates were opened thanks to a couple of big plays by the other two facets. Following an interception by defensive lineman Claudell Louis, Lloyd connected with Travon Van for a six-yard score. The extra point from Jose Maltos gave them their first lead of the night. Then came the real dagger, a blocked punt by 2018 second round draft pick David Mackie that set them up with another short field. Lloyd was then able to find Ricky Collins Jr. to extend their lead to seven points. Collins also had a game-high 53 receiving yards and the hungry Lions never looked back after he hit paydirt. “They’re (the defence and special teams) are the reason we were punching the ball in so many times. A short field all game? You have no reason to not punch the ball in every time,” added Lloyd. Count his head coach among those impressed with the performance. 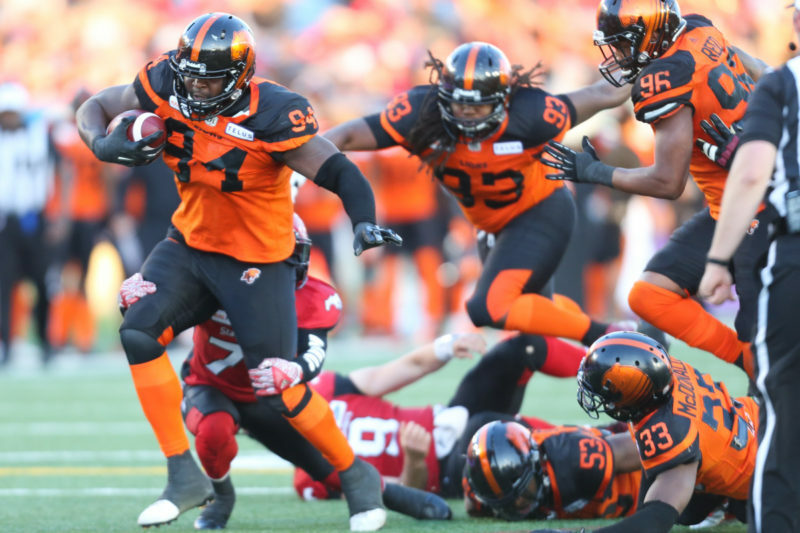 “You’ve got to give him a lot of credit, ” said Wally Buono. 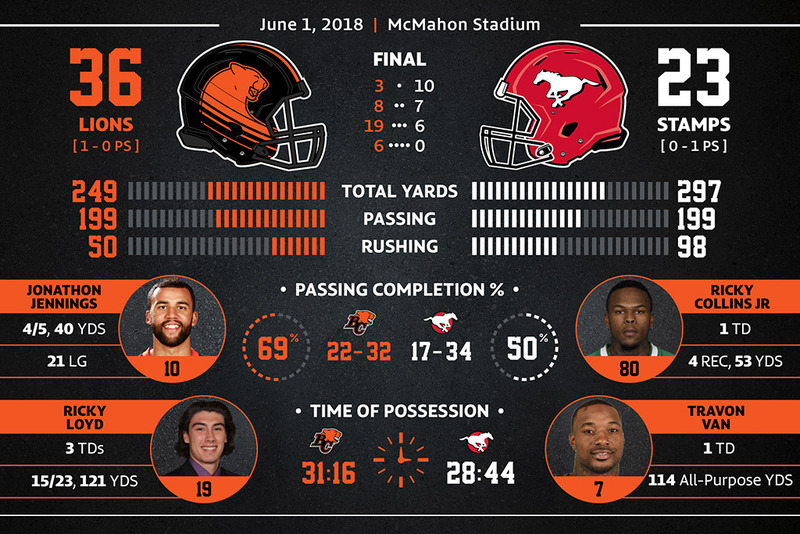 Although the visitors couldn’t get much going offensively in the first half, Jonathon Jennings finished four of five for 80 yards passing, the defence got them back in it with Keelan Johnson’s fumble return touchdown that helped closed the Calgary gap to five points at the break. And then, the Ricky show took full effect on a windy night in the Foothills city. 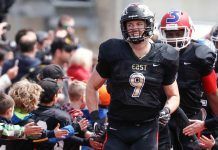 Perhaps the most impressive thing was that the youngster shared all of the credit with his receivers and offensive linemen. “They made me look good,” stated the QB. Even though nothing was at state as far as standings go, the collective feeling inside the locker room was that they accomplished something. And at this critical point of camp, that’s key. “Getting seven turnovers is not expected, but that’s something that we’ve preached,” said Buono. And no doubt something to build off for when they face the Winnipeg Blue Bombers to close out the tune up season next Friday at BC Place. 7– total number of turnovers forced by the Lions that resulted in 24 of the 36 points. That was one of the few goals going into this season: more takeaways. Although a small sample size, the aggressiveness on defence and special teams should be taken seriously. “He has a rocket arm, he can throw the ball, he’s composed back there and as you saw, he can make some plays. It was fun watching him out there. It’s always fun seeing new faces come in and tear things up.”- Jonathon Jennings on Lloyd’s performance. Claudell Louis’ 3rd quarter interception set the Lions up in business. It was one of seven turnovers on the night. From this vantage point, another impressive part of Lloyd’s game was his quick release. That was fairly evident when the Stampeders were rushing four. Take it for what it is: our backups played better than their backups. No one will deny there is still work to be done before camp breaks on Wednesday. Hat tip to Maltos. The Mexican kicker whose last foray into pro football in North America was a stint at New Orleans Saints training camp in 2013 successfully booted a 48-yard attempt to help salt it away in the 4th quarter. It was no doubt a nice recovery from hitting the upright on his first attempt. We told you to expect big things out of Dyshawn Davis, Jordan Herdman and Tevin McDonald in this one. None of them disappointed. Steffon Herd earned himself the defensive game ball after recording his big 4th quarter interception. You also have to feel good for Jeff Reinebold. The fiery coach has had a huge presence during his camp drills and to see his unit come up big on a couple of occasions was well deserved. Perhaps one minor weakness was the inability to stop the run in certain situations. That will be a major talking point once camp practices resume Sunday through Wednesday. 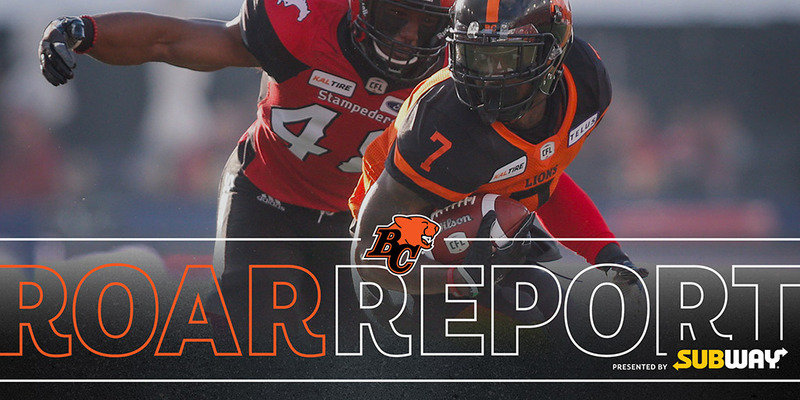 Both Fajardo and receiver Tyler Davis (ankle) were to be re-evaluated in Kamloops on Saturday.